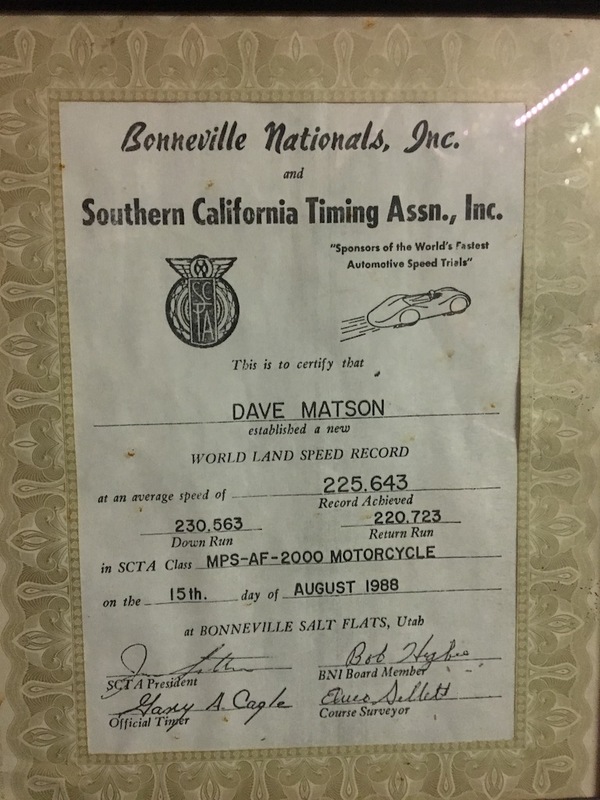 30 years ago today, August 15th 1988, Dave Matson raised his existing record in MPS-AF-2000 (modified, partial streamlined frame, altered engine on fuel, 2000cc), now called MPS-F 2000. 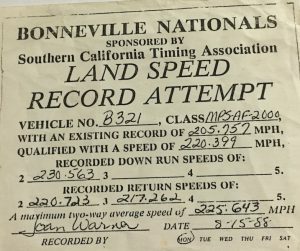 Back then, you had to first make a qualifying run over the existing record, which Dave did on August 14th, with a speed of 220.399 MPH. 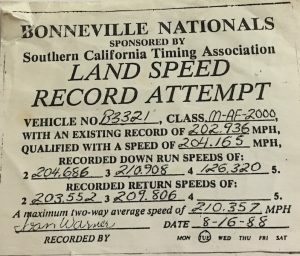 The next day, the 15th, he made 2 more runs used to calculate the average speed of 225.643 MPH. Later that same day, Dave took the fairing off, to run in class M-AF-2000, now called M-F, and qualified with a speed of 204.165 MPH. The next day, August 16th, Dave made the 2 runs to average 210.357. 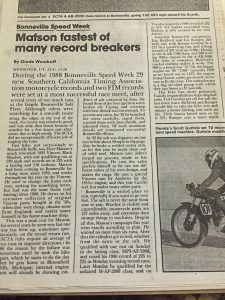 At the time, that was the fastest speed recorded by ANY unfaired motorcycle. 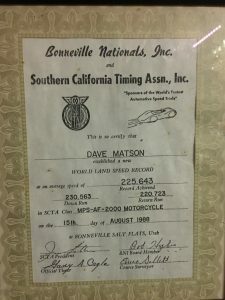 Dave’s 225 MPH record was near the top for any partial streamlined sit-on bike, I think the top record at that time was somewhere around 230 – 240 MPH. 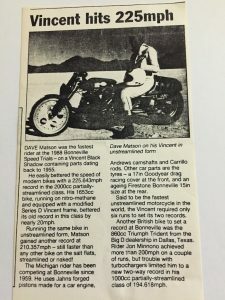 For 1988 Speed Week, both of Dave’s speeds were faster than any other motorcycle on the salt that year. 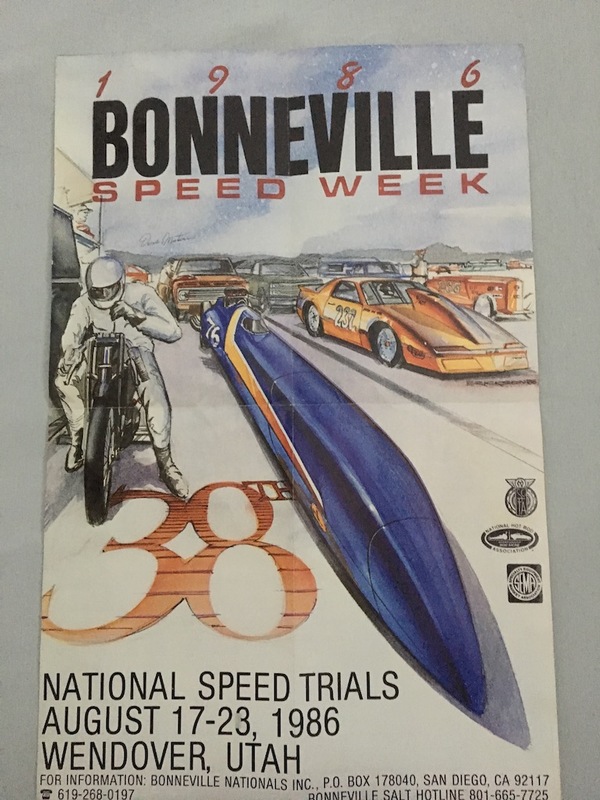 Both records are still in the SCTA record book, and the 210 MPH record is still the fastest speed with no fairing, and without forced induction (ie, excluding the blown classes, turbo or supercharger), that I see in the SCTA record book. Congratulations Dave, a remarkable achievement. Photos credits to Arlene Matson, Susie Ellsworth, and Steve Doherty. Click the thumbnails for larger images. 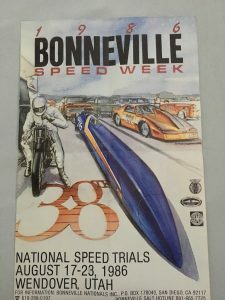 Here is another video from Lou Fischer, BonnevilleStories.com, the same gentleman that did the Terry Prince video. 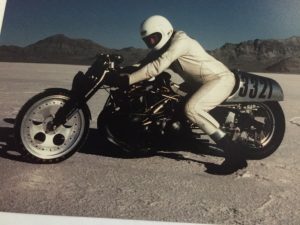 In this one, Marty talks about his experiences at Bonneville, including his association with Burt Munro. Here is a video about Terry Prince and his life long association with Vincents. Mal Hewett had quite a year on the salt last year. 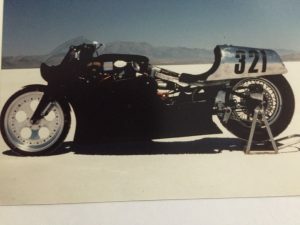 First, he went to Speed Week, and after making a rookie orientation run, Mal laid down a qualifying run of 151.033 MPH in the M-VG 1350cc class, almost 50 MPH above the existing SCTA record. 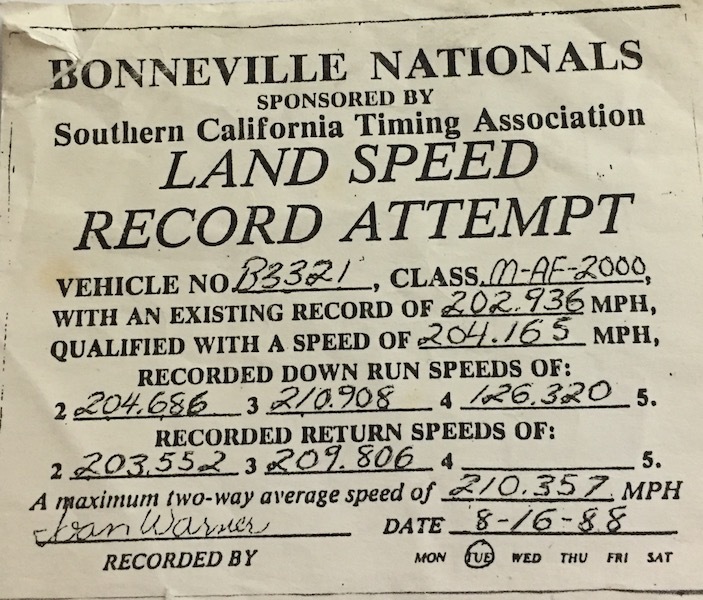 The next morning, Mal backed it up with a run of 152.637, for a new record with an average of 151.835 MPH. After adding his very nice looking fairing to run in the MPS-VG class, Mal qualified at 156.863 into a 10 MPH head wind. 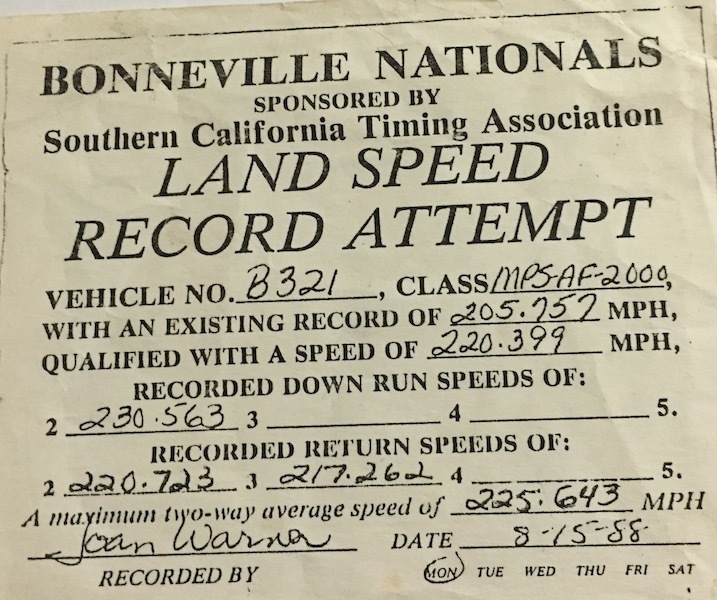 The next morning, the back up run was 163.293 with a slight tail wind and pulling 6100 RPM, for a new record at an average speed of 160.078, again breaking the existing SCTA record by almost 50 MPH. After a little sightseeing, Mal returned to Wendover for the BUB Speed Trials. 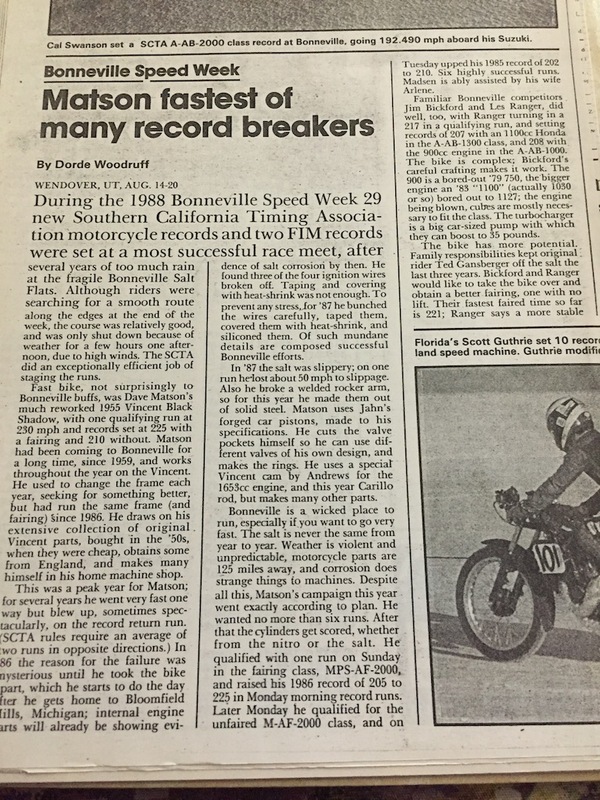 Unfaired, Mal ran 151.223 and 150.080 for a new record of 150.651, breaking the old AMA record of 121.795. With the fairing, Mal ran 162.692 and 161.317, establishing the AMA record of 162.004 in an open class.Way to go Mal, quite a banner year.